No clutter, no mess and everything in its place. It may sound too good to be true but with the right kind of storage solutions it’s perfectly possible. Our inventive range of storage furniture can help keep you organised in so many different ways. Designed to delight and built to last, all Genoa storage items are FIRA tested and are heat, stain and scratch resistant to give you years of faithful service. 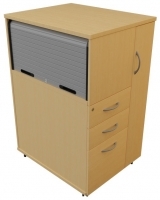 So, from open fronted bookcases to over desk tambour units, we have all you need for an ordered and stylish office life.